I promised the cover of the US edition -- and here it is, absolutely beautiful. It will be published in April. Meanwhile, some advance reviews have begun to come in. Kirkus said: "Gentle comedy, bitter tragedy and grief intertwine in an affectionately delineated portrait of an Indian hill community. While ostensibly offering a leisurely exploration of the town of Ranikhet in the foothills of the Himalayas, Roy (An Atlas of Invisible Longing, 2011) has achieved something larger, a poem to the natural world and its relentless displacement by the developed one. ...Roy pulls politics, society, ecological warning and history into her slow, episodic story, but it’s her love for the creatures, landscapes and eternal beauty of this place that inspire it. Finally events gather speed after an act of petty spite against a neighbor and his pet, culminating in death, a terrible discovery and an act of shattering revenge. Despite an occasional sense of drift, this understated, finely observed book expresses a haunting vision. A writer to watch." 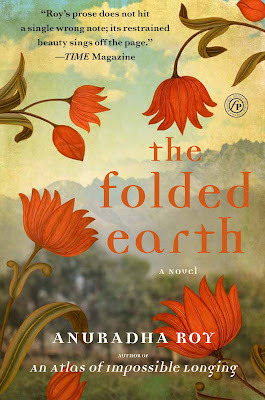 MS Magazine called it a "carefully observed story of separation, loss, and resourcefulness... an elegant marriage of psychology and nature... reminiscent of the great R. K. Narayan's poignant tales of rural India." Elsewhere: Bookbag, UK, said "There is a steel hand in the velvet glove of Roy's story-telling...There are three great strengths to this book. Firstly, the contrast between the timeless majesty and beauty of the landscape and the all too brief lives of the often rather less noble human residents who live there. This leads to the second reason that this is such a good read: Roy creates some wonderful, often quite eccentric characters. You can always tell when this is done to perfection when even the smallest bit part characters seem to come to life with a few brief idiosyncracies. The final thing that stands out about this book is that, while at times it's not altogether clear where the plot, such as it is, is heading, the final few pages make sense of the whole thing and may surprise you and will probably make you smile". introduced to Maya’s microcosm — Diwan Sahib, Charu, Ama, others — there is familiarity and recognition as all of these people exist in our lives as well. They are our friends, confidants, relatives, acquaintances and help. The dynamic the writer weaves between these all-too-real characters is instantly identifiable and at times frighteningly real." Absolutely cannot wait to read this!